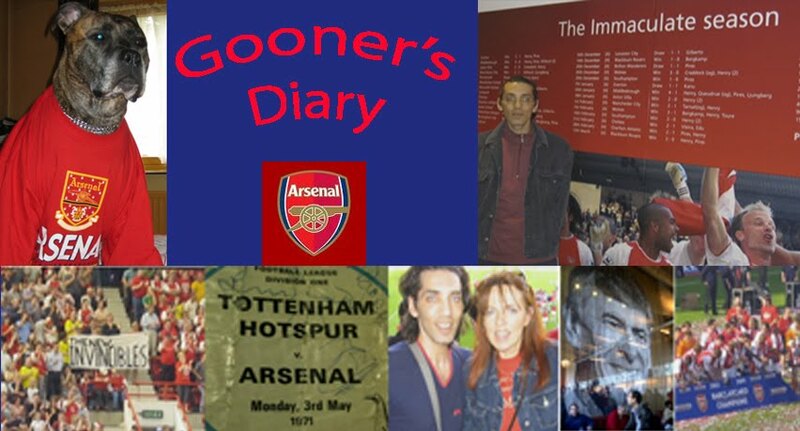 Gooner's Diary: Bridge Of Sighs Or Highs? Bridge Of Sighs Or Highs? It's another "twofer" week, since I wrote the following diary piece last Sunday night/Monday morning, for publication in Wednesday'Irish Examiner and I never got around to posting it out, in my rush to get it finished and filed to the paper so that I could go and get my motorbike MOTd - as much to my great distress, I returned from working on Saturday night to deliver a hired truck back on Sunday morning, only to find that the car had been stolen. I was so cream-crackered, after a hard day/night's work, that the last thing I needed at 7am on a Sunday morning was to discover we were car-less. Quite apart from all the aggro of having to report this crime to the old bill and the insurance company, it was the long schlep back from Greenford on the tube which was just about the last thing I needed. I suppose it could've been worse, as I was considering unloading the truck in Kent in the middle of the night, just to avoid any traffic and them I would've arrived back at Greenford before the tubes started running, but after setting out only to find myself forced to take a massive long detour because of the Blackwall tunnel being closed, it was one of those "last straw" type moments, which left me feeling as if the whole world was against me and the thought of having to deal with the whole bothersome matter and having to sort out some new wheels, left me feeling desperate to get home, slide under the covers of my much needed bed and never poke my head out from under the duvet again! What I couldn't understand was why anyone would want to steal my positively ancient motor, as I don't imagine there's such a massive demand in the Middle-East for 20-year old Rover's, that someone would want to make a "ringer" out of my old banger! But when I posed this question to the kindly policeman who called from Southall nick the following day (I got quite excited, thinking they'd found my motor around the corner and was extremely disappointed when I realised he was only phoning for answers to some of his many questions), he pointed out that there are many unscrupulous characters driving around in low-loaders, who'll pick up cars like mine, merely for the scrap value, which is a real wind up, as despite being old, this car's been such a great & reliable runner, that I don't think we've needed to spend a penny on it since we bought it. And by the time the insurance company deduct the excess, I imagine any pay out I receive from them will be a relative pittance and the chances of finding another equally dependable motor are very slim. Just as in football, the old adage about paying peanuts and getting monkeys proves true for most things and I'm probably going to end up buying someone else's problems for the few pennies I'm likely to have to spend, getting the same clapped out monkeys that we keep ending up with in the Arsenal goalmouth! I tell you, it's enough to turn anyone to religion! I was joking about Avram Grant's day of repentance not paying off, when the Hammers failed to win on Yom Kippur, but the Irons results since might be viewed as some sort of testament to the power of this religious malarkey. By contrast to the Hammers wins (away to Sunderland and at home to Spurs - first win against the scum at Upton Park for four years! ), we might've enjoyed a Carling Cup victory at White Hart Lane, but we've endured a gut-wrenching 95th minute equaliser at Sunderland, an awful performance against the Baggies and a flattering result in Belgrade (considering our lethargic display). Never mind our keeper troubles and the lack of a proper leader, perhaps I'm entirely culpable for what has transpired since, by incurring the wrath of the G-ds in taking the piss, by not only fasting but by revelling in a scrumptuous bacon sarnie. With no car, at least for the immediate future, I thought I'd better get my motorbike sorted, so I at least have some form of legal transport and as I sat in this garage in Hackney waiting for my bike to be tested, I read a match report in the Daily Mirror (could it have been written by John Cross?) which I thought was sufficiently amusing, that if it wasn't already too late, I would've returned home and completely rewritten the piece below for the Examiner, as to my mind, it read like a load of tedious tosh, compared to this rib-tickling match report on our most regrettable result. I rarely tend to read the newspapers nowadays, especially in advance of writing my diary pieces, as otherwise it's somewhat inevitable that I end up feeling slightly paranoid about whether my ideas are original, or if I'm just rehashing something I've heard / read elsewhere. But if this was an example of the sort of standard that's regularly being maintained in the written media, then I guess I will have to start reading the papers again, if only to ensure that I don't get complacent and that I'm always striving to raise the bar, rather than to be left feeling so disappointed that it reads like I've toshed the following piece out, compared to a professional's far more enjoyable writing. In the past I've always relied on my Scouser pal, Steve Kelly, who writes for the same feature as me, to keep me on my toes, as his weekly diary pieces are invariably such a good read that this gives me something to aim for. Although I have to admit that I've given up entirely on being as concise as him. I might have improved considerably over the course of 11 seasons, as I no longer forward any War & Peace length opii to the Irish Examiner's encumbered editor(as I leave these for the questionable pleasure of you poor unfortunate blog readers). Having long since been issued with a yellow card warning from the sports ed, I don't want to end up getting a red and the "tin tack" that would undoubtedly accompany it (even if, after all this time, there must eventually come a day when my diary pieces for the paper reach a natural conclusion). However I consider it an achievement if my missives come in under a 1000 words and unlike Steve Kelly, I'll never have the discipline to produce 750 word pieces on the button every week - besides which, there'd be no need for editors, if every writer was that accurate with their efforts! Even if I wasn't particularly happy because I felt that the following missive was far too mediocre for public consumption, I intended sending it out in advance of Tuesday night's match. But naturally I managed to forget (so what else is new!) and then having written a blog entry of a few thousand words since then, I can't believe there are any thoughts in my missive below that I've not already pontificated on at some length. Pessimist that I am, it seemed obvious to me that the Gunners would blow a rare opportunity to capitalize on Chelsea’s defeat, from the moment the final whistle blew at Man City on Saturday. Mind you, Saturday’s failure to reel in the league leaders might only prove significant, if the Arsenal are capable of mounting a credible challenge for the title. While I continue to have faith that on our day, our best XI players are a match for anyone, sadly I can’t envisage our current squad winning the Premiership, not unless it’s gifted to us by the inconsistency, or the complacency of the competition.official. It appeared as if one singular injection of pace by Carlos Tevez won the day against Chelsea, in an otherwise ponderous, low tempo encounter. All due credit to the Baggies for giving the Gunners a taste of our own footballing medicine, but I felt that they were allowed to grow increasingly confident as the game wore on, as a result of a similarly lethargic and uninspired Arsenal performance. It’s very rare to hear Wenger publically criticising his team. His willingness to do so on Saturday was perhaps a reflection of the fact that our esteemed manager feels under increasing pressure to lead us out of a silverware starved wilderness, to a trophy-laden promised land. Perhaps this was reflected in the line-up for the midweek Mickey Mouse Cup encounter at White Hart Lane, which included a good deal more experience than we’ve grown accustomed to in previous seasons. My Spurs pals tried to assure me that somehow their Carling Cup exit didn’t feel nearly so significant, now that they have Champions League fish to fry. But I pointed out that they’re faced with the same Catch-22 situation that’s afflicted us in recent campaigns, whereby the demands of a European marathon make prioritisation essential. But that this could all end in tears, when their Champions League dream draws to a premature conclusion, leaving them with nothing more to play for. Arsène might be more accustomed to the annual juggling act involved in managing the Arsenal’s resources, but I don’t imagine anyone expected these to be stretched to the limit, so early on in the season. His team selection on Saturday hardly inspired me with confidence. Aside from the increasing clamour over le Gaffer’s failure to address the goalkeeping issue, one other recurring criticism concerns his tendency to focus solely on his own side, rather than targeting his team selection, according to the respective strengths and weaknesses of the opposition. Moreover, Arsène’s apparent reluctance to make ‘on the hoof’ tactical changes is often a source of much frustration. Work commitments either side of Saturday’s game meant that I had to go to inordinate lengths just to be there and although I was completely ‘cream crackered’, I was buoyed by the euphoria of beating the scum 4-1 and Chelsea's slip up against City. Considering all the effort involved on my part, it was bitterly disappointing that the majority of my team couldn’t be bothered to turn up. Instead of tearing out of the starting blocks, like a side fired up by the opportunity to prise open the door left ajar by Chelsea, they plodded out, reminiscent of far too many of last season’s performances, where, convinced of our own superiority, victory was just a matter of waiting until the Baggies began to flag and the waters of the West Brom defence parted like the Red Sea. Even if I was a fan of this tactic, it’s dependent on the sort of precise passing which leaves the opposition exhausted, chasing shadows, not the sort of slipshod, casual play witnessed at the weekend. But more importantly, the lack of any real intent on our part allows our opponents time to relax, to the point where they begin to believe themselves capable of upsetting the odds. In fact at times on Saturday, the Baggies appeared to be so comfortable on the ball, adorning their play with clever backheels and incisive passing, that they looked far more Arsenal like than our lacklustre side. We’ve barely the personnel with only Chamakh and Vela to choose from at present, but personally I’d much prefer a show of intent in home games against lesser opposition, by starting with two strikers, instead of gifting away home advantage by giving visiting defences a lone front man to deal with. Although it served Wenger well for so many years, unfortunately 4-4-2 seems to have become thoroughly persona non grata nowadays. Almunia’s penalty save 10 mins before the break should’ve been the turning point, but the fact that no one responded to the roar of the crowd, by driving the team forward, is just further evidence of the crucial lack of leadership in this Arsenal side. It was no surprise that we were 0-2 down before Wenger was eventually forced to ring the changes. But then as they say, you can’t make an omelette without eggs. While Samir Nasri made a valiant, almost singlehanded effort to rescue a result at the death (much to the chagrin of all those premature evacuators), this only left me bemoaning the Gunners failure to pull their collective fingers out from the opening whistle and the fact that we lack the sort of personalities who are capable of putting a flea in the ear of their “below par” compadres. Here’s hoping we’ve bounced back in Belgrade, so we can travel to Sunday’s clash with heads held high, as we certainly don’t want to be turning up at Stamford Bridge with our tails between our legs! Whether its 442 or 451/433, there is no excuse for losing at home. The fact is there are too many underperformers at the moment. Even when Almunia plays well, the rest of the team still don't appear to have confidence in him. I can vouch a number of different excuses/theories for our recent performances. Arshavin is lazy, he even admitted he is overweight (how is that acceptable at this level?). Key mistakes, what were Clichy and Koscielny doing last weekend?. Lack of quality, I don't think Denilson or any of the likely goalkeepers are up to it at this level. As for our first 11 beating anyone on their day, that may be true, but I don't think that will ever materialise due to their lack of resistence to the riguors of regular football. I can't ever recall being so pessimistic going into a Chelsea game. Am I setting the bar too high? PeterTippettHaulage offers Heavy Haulage Australia,Heavy Haulage Australia, Tilt Tray Hire, Mining Machinery Transport, low loader truck hire, Heavy Haulage Brisbane, Low Loaders Brisbane, Gold coast, Sunshine, Queensland, Perth, Heavy Haulage Transport, Low Loader Truck Hire services in Australia. People should go for the best floor jack guide because it is related to their safety when they have to go underneath their car to repair it. So we should not compromise that fact.